Sail 4 Cancer Testimonials > Iona Water-skis towards freedom from cancer! Iona was nominated for a Sail 4 Cancer respite opportunity by David, a friend of her father, as he was so intensely moved by this little girl's bravery. At the time one of Iona's friends she had met at the hospital had relapsed and this had deeply shaken Iona and her family. David said, "She told her mum not to worry if the leukaemia comes back, that they will beat it. She is 10." It was shortly after her 10th birthday that Iona was diagnosed with acute myeloid leukaemia. From that moment on and for the next six months she was almost completely hospital bound, escaping home for the odd week-end between chemo treatments, finally being allowed home on Christmas Eve. She was then required to attend monthly check-ups, as her father, Cameron, explained at the time, "The day of the check-up is stressful as we await the results but other than that Iona is trying to lead as normal a life as possible. She is doing really well and apart from her short hair no-one would ever know, but we are reminded every month that it could all change again so easily." It was during this time that her friend relapsed, bringing that further reminder to them all. Sail 4 Cancer felt that the family definitely needed some quality time together after everything they'd been through. Cameron was a little unsure which respite opportunity to choose initially as, although his elder daughter Lauren loves sailing, Iona had never been a great one for water activities. However she then had a go at dinghy sailing and kayaking on a school camp and loved it, so the family went ahead and booked a Neilson watersports holiday in Turkey, subsidised by Sail 4 Cancer. Cameron says, "It was a fabulous family holiday. We had a wonderful time not only taking part in familiar activities but also learning new skills such as waterskiing. 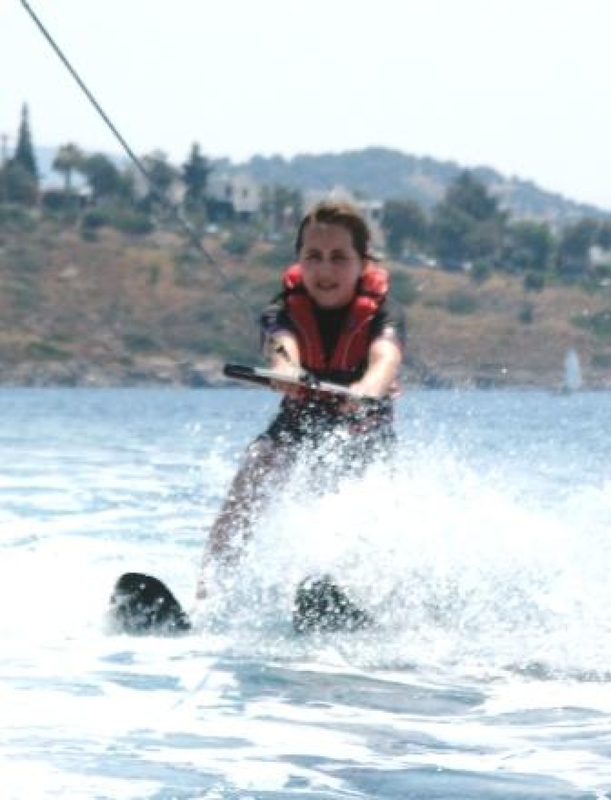 To see my daughter sailing, waterskiing, making new friends and smiling throughout was just fabulous." He praised Neilson highly for their wonderful holiday - and also for not making any sort of fuss over Iona. "It was just what she wanted - to be treated like a normal young girl." Iona herself says, "Thank you very much for organizing our holiday to Ortakent. I had an amazing time! It was very hot and it was nice to go in the sea to cool down. 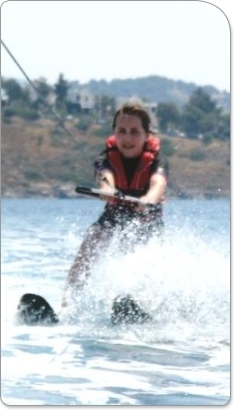 My favourite activity was waterskiing because it was a whole new experience for me to try. I really really really enjoyed the holiday in Turkey even though some of it wasn't in the water for example the kids club took us out to the Turkish Baths which really fun. We also went out on a gulet for the day and we got to relax and jump of the boat at different bays and look for some fish. Thanks again! Here is a picture of me water skiing!" Cameron sums up their Sail 4 Cancer experience: "Going to Turkey with Neilson made us feel like a normal family again. Nobody knew what Iona had been through, all they saw was a young girl with short hair making friends and having a great time."